Slide your finger over the floors to move up and down the floors. 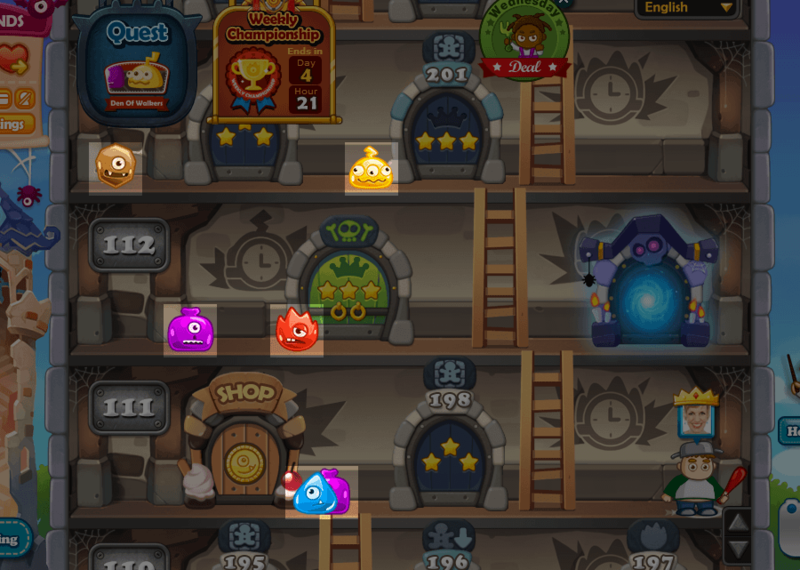 You can also tab on "<" sign at right middle side of the screen then whole Monster Tower will be shown. You'll be able to see which floor you're on and where your friends are. You can simply tab on the floor you want to move to. 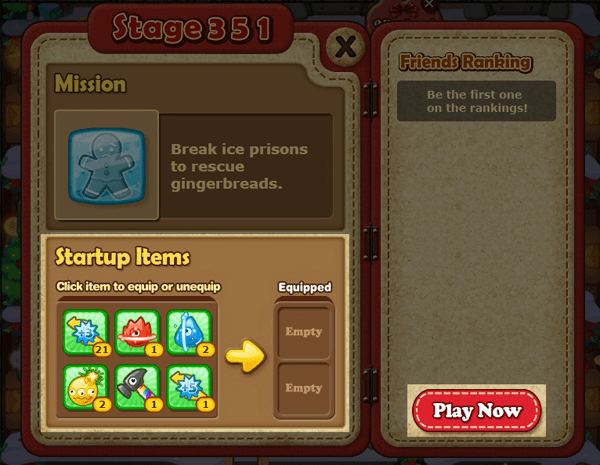 You can tab on '<' sign at right middle side of the screen to see Monster Tower. 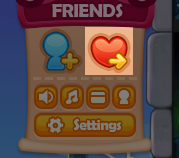 Profile picture of your friends tell you where they are, you can tab anywhere in the tower to move to that floor. 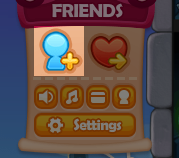 Tab on your friends avatar with the bubble over their heads where blue-person and plus sign icons are in. Invitation will be sent as soon as you tab on the avatar. 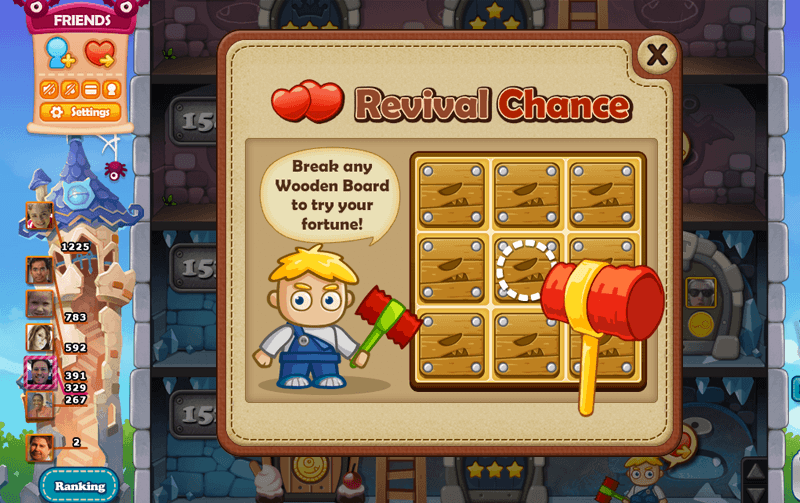 You can get coins by clearing stages. Coins will be given everytime you earn new stars. If you're cleared with the stage and play it again, not the same amount you received when you cleared it first time but less amount will be given. Coins are also sometimes given out of little monsters wondering in the tower when you smash them and of blockers that have a life to kill when you eliminate them during play. 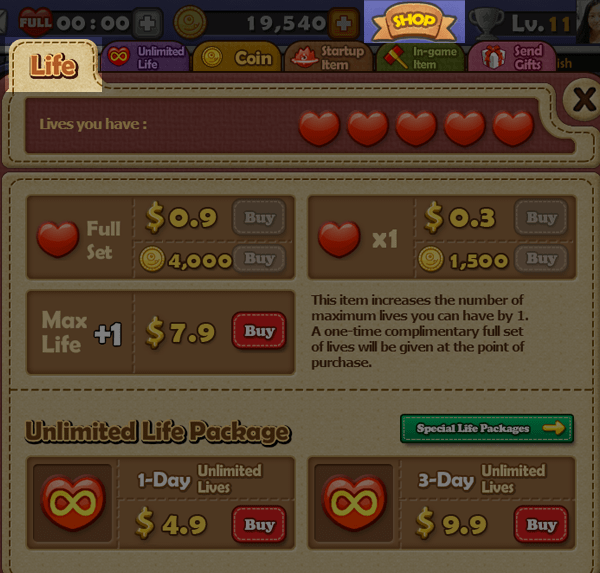 You can also buy between 10,000~500,000 coins at the shop. 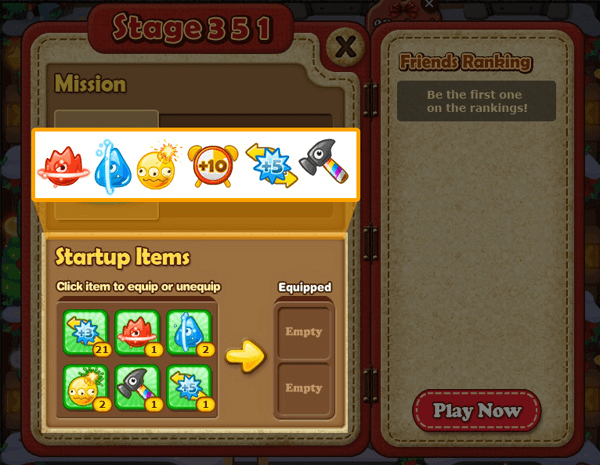 You can get coins by clearing stages. Coins will be given everytime you earn new stars. If you're cleared with the stage and play it again, not the same amount you received when you cleared it first time but less amount will be given. Coins are also sometimes given out of little monsters wondering in the tower when you smash them and of blockers that have a life to kill when you eliminate them during play. 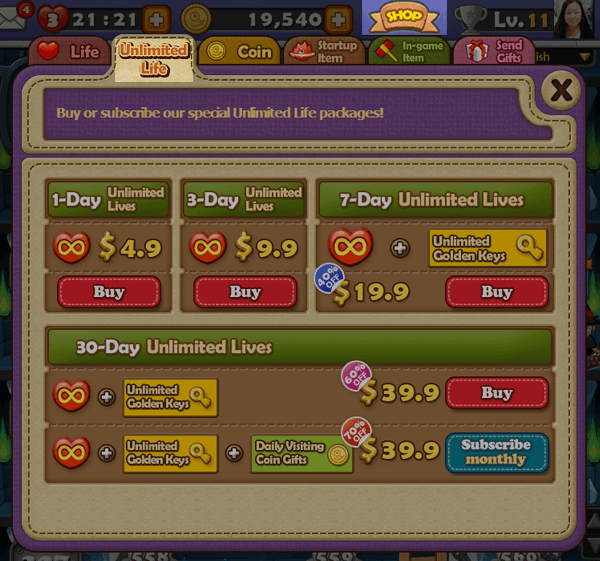 You can also buy between 10,000~500,000 coins at the shop. 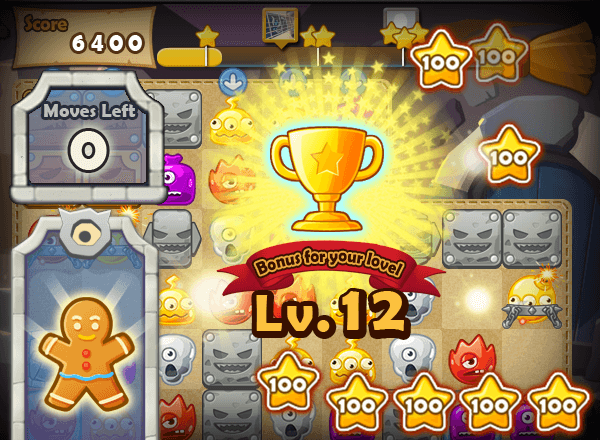 You can get coins by clearing stages. Coins will be given everytime you earn new stars. If you're cleared with the stage and play it again, not the same amount you received when you cleared it first time but less amount will be given. 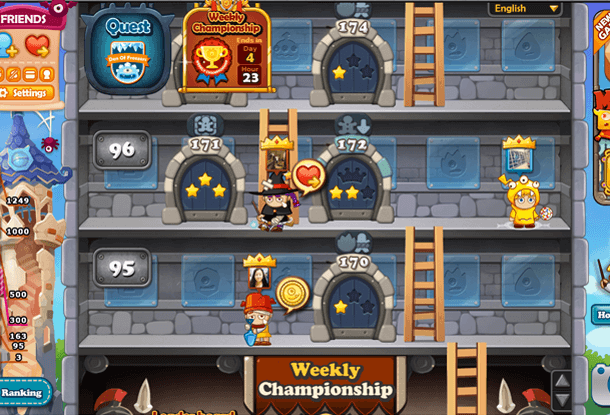 Coins are also sometimes given out of little monsters wondering in the tower when you smash them and of blockers that have a life to kill when you eliminate them during play. 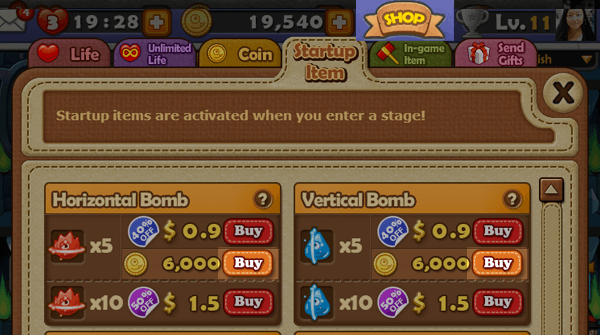 You can also buy between 10,000~500,000 coins at the shop. 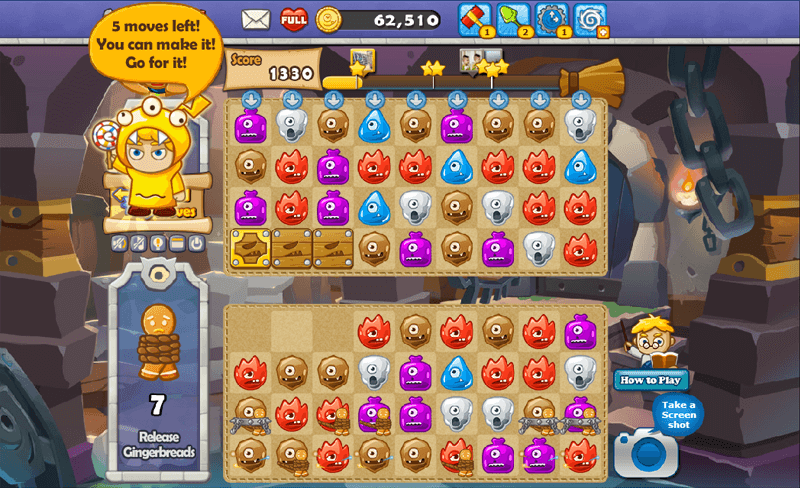 There are four gray cloud-shape icons at top left side of the game screen. Click on the first one to turn on and off the sound. 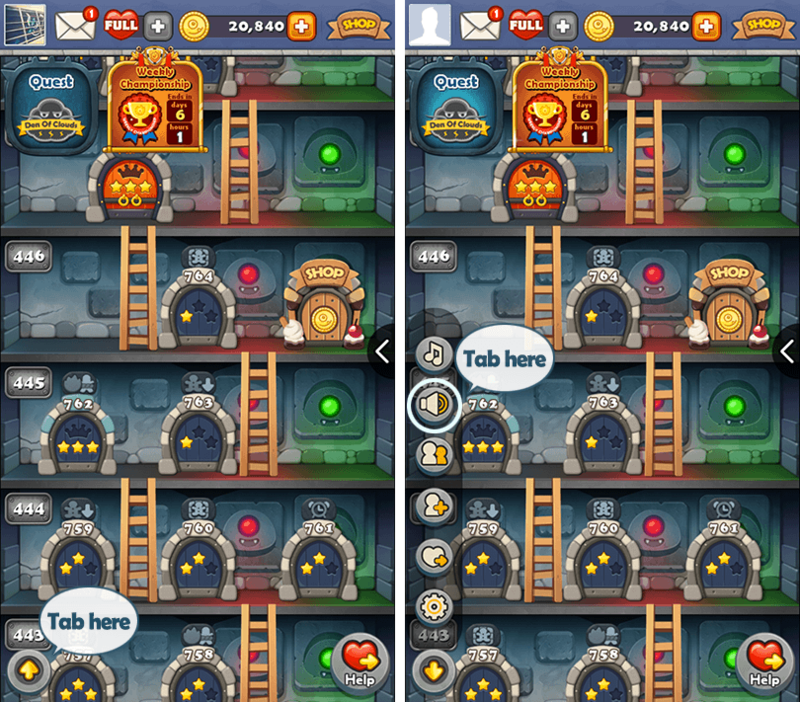 Tab on up arrow(↑) icon at left down side of the tower screen. When a line of icons pops up, tab on second icon from top, the speaker icon, to turn on and off the sound. 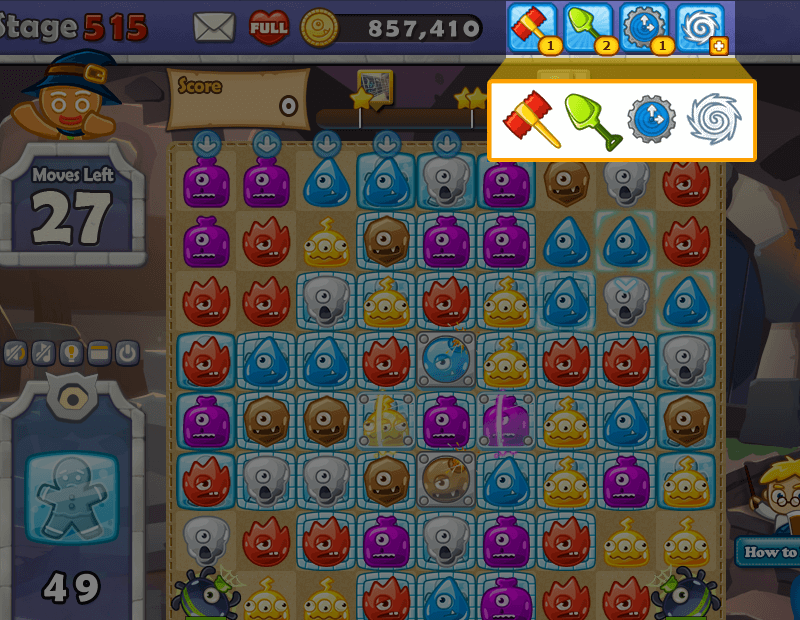 There are four gray cloud-shape icons at top left side of the game screen. Click on the second cloud to turn on and off the music. 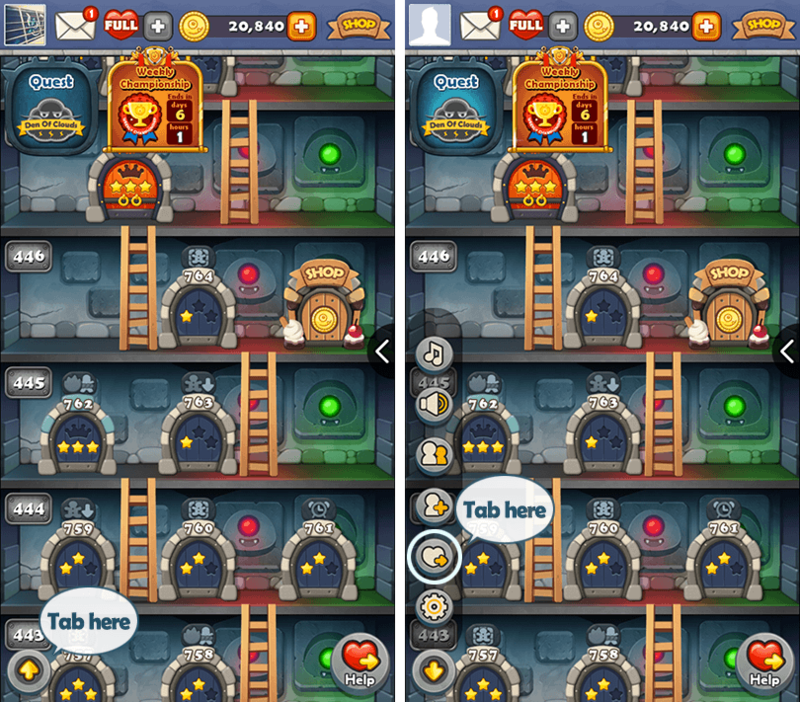 Tab on up arrow(↑) icon at left down side of the tower screen. 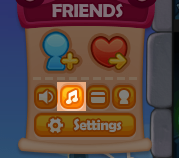 When a line of icons pops up, tab on first icon from top, the musical note icon, to turn on and off the music. 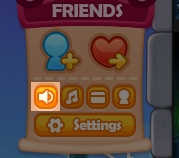 There are four gray cloud-shape icons at top left side of the game screen. Click on the third cloud to switch to full screen. It will switch back to window when you click it again. 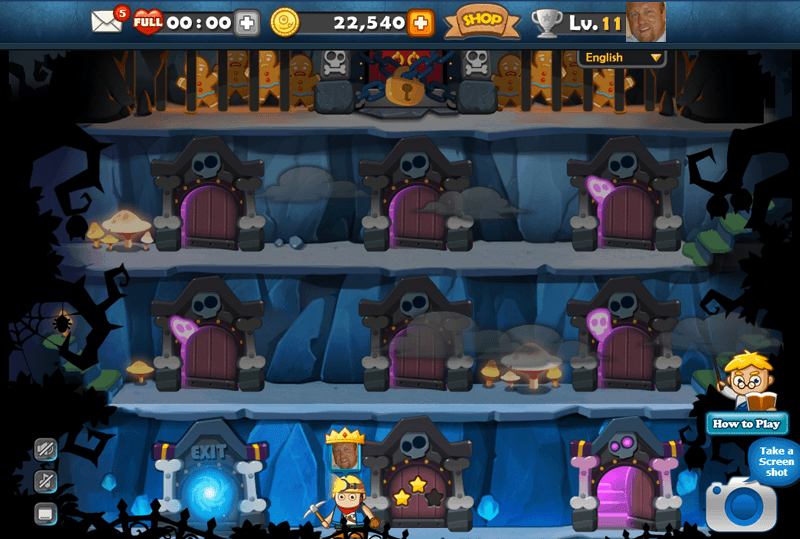 There are four gray cloud-shape icons at top left side of the game screen. Click on the last one to hide and show your friends' avatars. 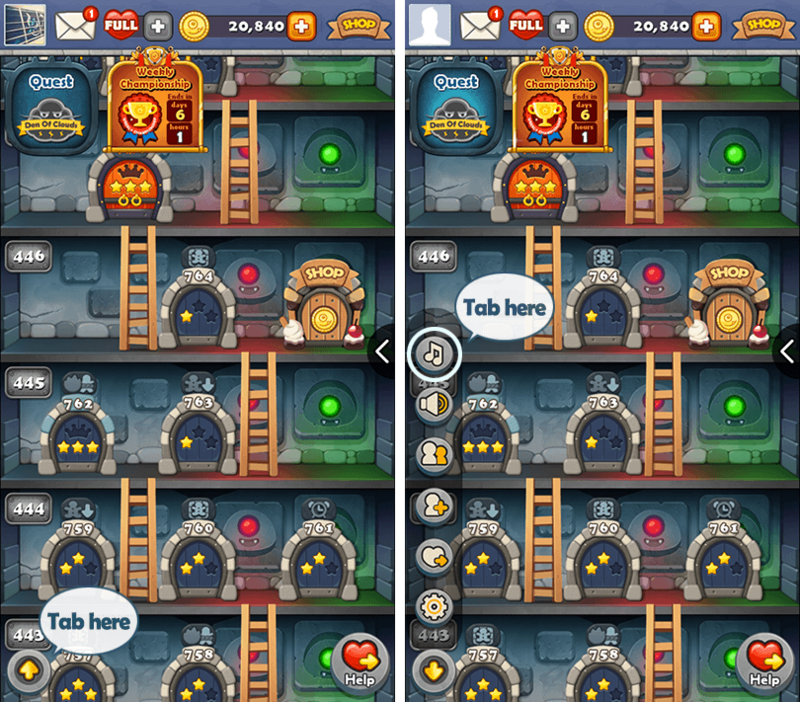 Tab on up arrow(↑) icon at left down side of the tower screen. 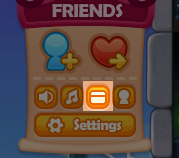 When a line of icons pops up, tab on third icon from top, the person-like icon, to help your friends. 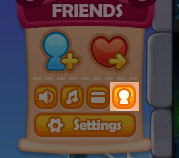 You can also tab on bubbles over your friend avatars heads in the tower to send lives or items. 1. Click on your own avatar. 2. Click 'change' button to see the different types of avatars. 3. Choose your favorite one. 4. Click 'Ok, I'm ready' button. 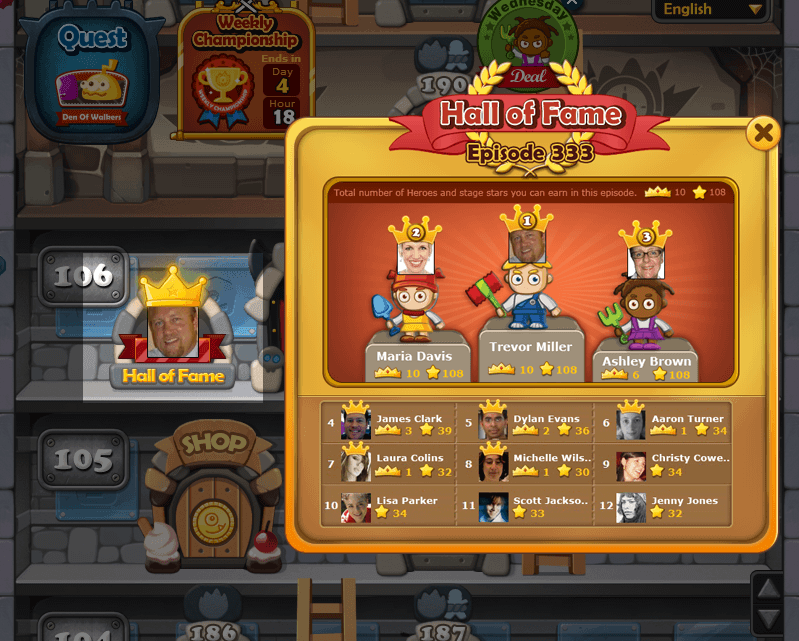 Tab on your own avatar to see how many stars you need to collect more to level up. 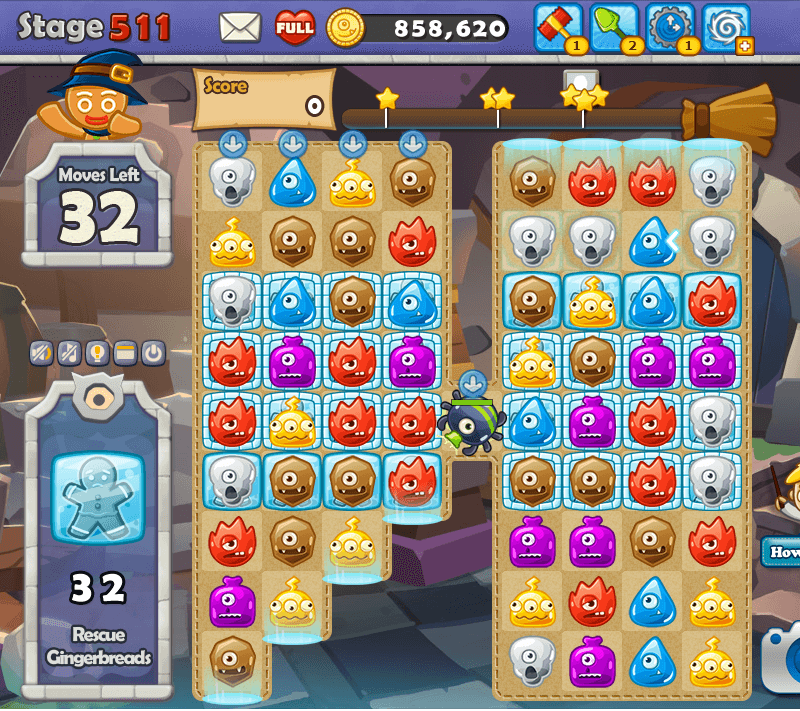 Secret Quest is a whole new theme of play you can find another entertaining elements in the game. You can play these secret stages when you reach specific floor set in the tower. 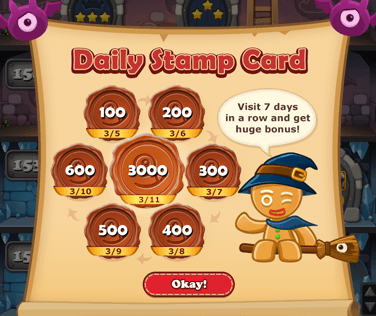 Each Secret Quest has different theme, you can achieve Quest mission and acquire a special badge. Game won't load on my mobile phone. 1. Check to see if you have Wi-fi or network connection. 3. Check if you have the latest version of Facebook app on your mobile. Please download one if you don't have it. 4. 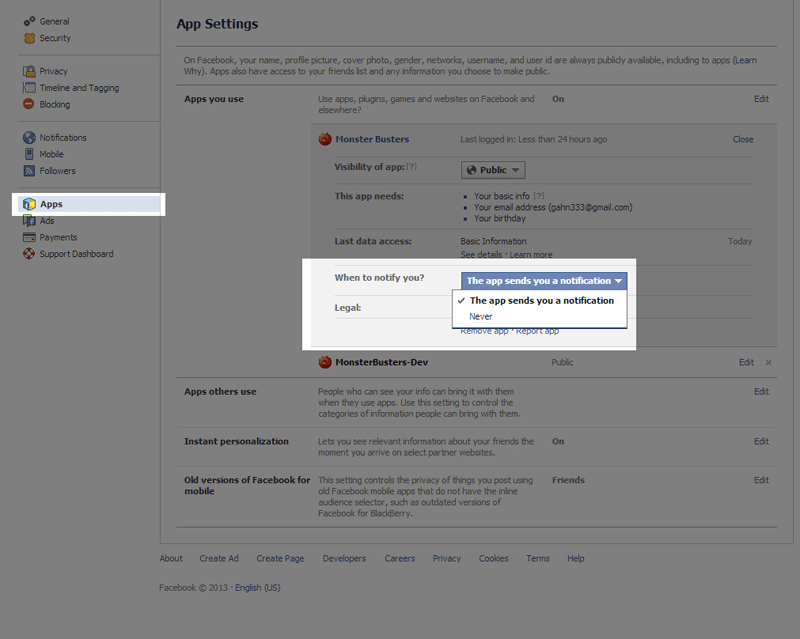 You already have Facebook app and it's most up-to-date version, log out, log in again, then open our app. 5. Reboot your phone or close other running apps. I receive Facebook connection error on my iPhone and/or iPad. Change the setting of your mobile. 1) Go to Settings of your mobile. 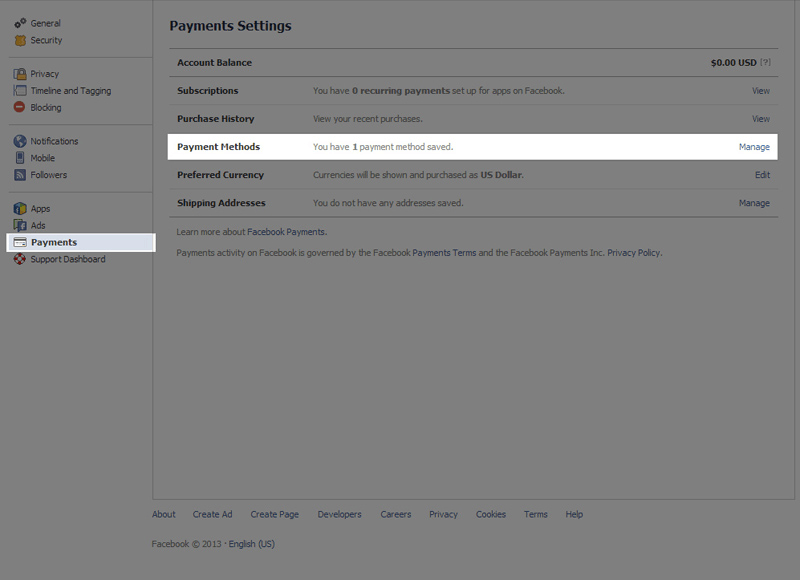 3) Turn on the button next to MonsterBusters allowing access to use your account. I can't connect to MonsterBusters app since I changed my Facebook password. 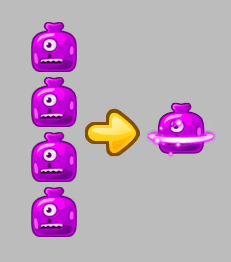 Log out from both Facebook and MonsterBusters apps then close them. Then open Facebook app on your mobile, log in to Facebook, then open MonsterBusters app to see if your new password works. If it still causes problem, try deleting both apps then reinstall. (on iPhone and iPad) Check your mobile setting to see if your Facebook password is well set and if you're allowing MonsterBusters app to run properly on your phone. 1. Enter your valid Facebook password. - Turn on the button next to MonsterBusters allowing access to use your account. The game crashes while playing the stage. Can't connect to Facebook login. Because of this, users who have agreed to the previous policy can't log in right away.